Went last night to Cowboys Steakhouse in Prague (part of the Kampa Group) with my mom, Kamila, and Radek. Kamila and I haven't been there since it opened, so she was eager for another visit as she's a big steak fan. The first thing my mom commented on was the decor - having grown up on a farm, she knows a fair bit about cows. She couldn't help but point out that the black and white spotted upholstery in the restaurant is the coloring of a Holstein cow, which is a dairy cow, not a cow you make into steaks. The good news for my mom was that Cowboys is now a completely non-smoking restaurant, which is still somewhat unusual in Prague. I can understand the thinking behind this decision - Cowboys serves mostly expats and tourists, and they don't want their 1000 CZK steak ruined by the cigarette smoke wafting in from the next table. Kamila had the Steak Tartar to start (did I mention that she really likes meat?) and pronounced it to be some of the best she's had. Radek had some tuna dish, but I didn't ask him what he thought of it. My mom and I made do with the little bread squares in olive oil that were placed on our table. 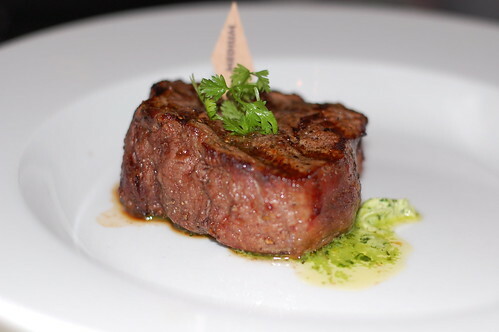 As for the main course, Kamila and Radek had the Filet Mignon (see photo above), my mom chose the American T-bone, and I went with the cheeseburger. All the steaks were excellent (according to my dining companions), and my cheeseburger was very good (but I don't eat cheeseburgers very often, so I may not be the best person to judge). We didn't have dessert, choosing instead to wander down Nerudova for a coffee at the newly opened Starbucks in Prague. So, we had very good food, and the service was attentive. The only issue was, of course, price. If you eat at Cowboys, and order a starter, some wine, and a steak, plan on spending at least 1500 CZK ($85.00) per person. I'll definitely return, but for a regular night out, $200 for two is a bit steep for my tastes. 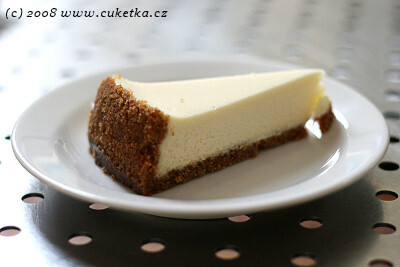 Here in the Czech Republic, there is a well-known food blog by the name of Cuketka.cz (which means "little zucchini" in Czech, hence the title of this post). While it is undoubtedly most popular for the quality of the writing, one is also struck by the interesting photos, which are much better than the photos on the average blog. 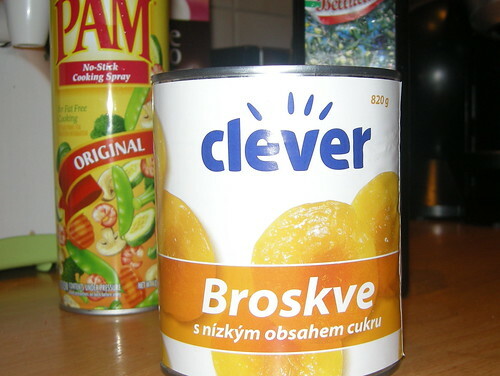 A good example can be seen in his post on Bakeshop Praha. Cuketka hasn't written much about how he takes his photos, so I thought I'd write a quick post to explain how to take these kinds of "artsy" shots (product in focus, background out of focus). The main technique is to use a very shallow depth of field, which is something commonly seen in food magazines but impossible to pull off with most "point-and-shoot" cameras. Quick answer: get a fast lens. Open it up all the way. Shoot photos. Not very appealing - the entire shot is in focus (which is normally a good thing, by the way), and it looks very clinical and lifeless (compare this to a food shot on Cuketka.cz). You can take very good photos with a pocket camera if you know what you are doing (I don't, really), but you are going to make your life a lot easier if you get a slightly better camera. What you need to buy is a DSLR (Digital Single-Lens Reflex) camera. You don't need to break the bank to get a camera with interchangeable lenses - you can get a Nikon D40 for under $500 on Amazon.com. Your DSLR will usually come with a "kit lens" (the lens included with the camera), and this is the lens you would use for most "normal" shooting. But for shallow depth of field shots, you'll want to get a "faster" (lets more light in) lens than comes with the camera. A 50mm f/1.8 lens will do nicely for this. You can get a Nikon Nikkor lens for about $110 in the U.S., and the equivalent lens for a Canon body is even cheaper. What this lens will allow you to do is open the aperture (the "pupil" of the lens) much wider, which will reduce the depth of field of the shot. Thus it will be very easy to have something 50cm away in focus, while objects 70cm away are out of focus. 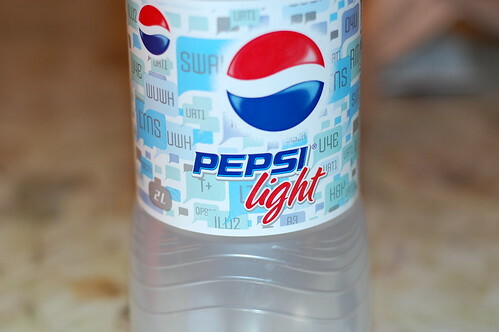 In the shot below, the Pepsi bottle is in sharp focus, while the table top only 15cm away is completely put of focus. In fact, using a 50mm f/1.8 lens, you can reduce the depth of field to only a few centimeters. 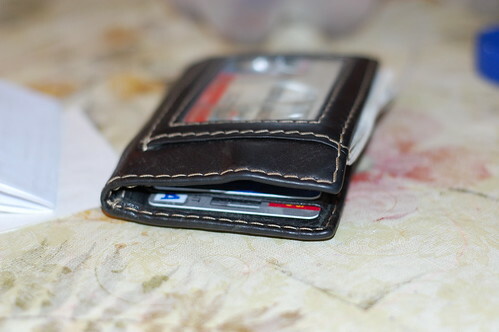 In the shot below, the stitching on the front of the wallet is in focus, but the driver's license on top is completely out of focus despite being only 3-4cm farther away. Using this technique, you could photograph a portrait wherein the person's face was in focus, but his nose was out of focus! So, let's try the peaches shot again. All I did here was attach the 50mm lens, frame the shot (badly), and shoot. It's not going to win any awards, but it's a lot closer to what we want from a food shot than the photo above. So, it's that easy. A DSLR and a fast lens, and you can be on your way to shooting photos like Cuketka (or Belcarnen, or Matesola, or GurmetKlub, etc.). Postscript: there's another well-known food blogger in Prague, who I'm guessing is taking flash photos with a pocket camera for his reviews. Not as pretty as the shallow-depth-of-field shots, but they are in some ways more honest depictions of the food he was served. For example, in my "artsy" shot of the Pepsi bottle above, it almost looks like real food, and we know it is not. We've just started the process of adding Copenhagen listings to the Nelso sites. 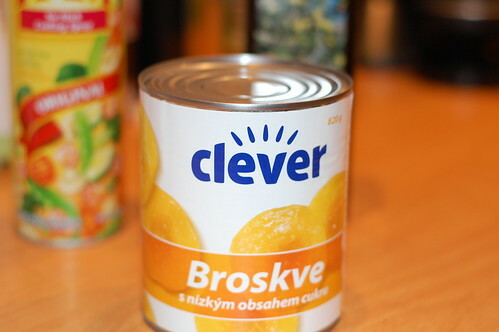 This includes translating all the listings into Czech (Copenhagen is Kodaň in Czech). I haven't found any comprehensive guides to Copenhagen in Czech, so will be interesting to see how we rank for Copenhagen-related searches on Google.cz. Hasbro will be issuing a new version of Monopoly with world cities in the place of the Atlantic City streets of the classic edition. To determine the cities to be included, they are taking votes on their site. Unfortunately, Prague is ranked #32 in the voting, which means it won't make it into the game unless the city gets more votes by the end of February 2008. Go to www.monopolyworldvote.com to place a vote for Prague. A Spanish travel blog, diariodelviajero.com , has linked to the beer map of Prague. I really need to get the site translated into Italian and Spanish as soon as possible.